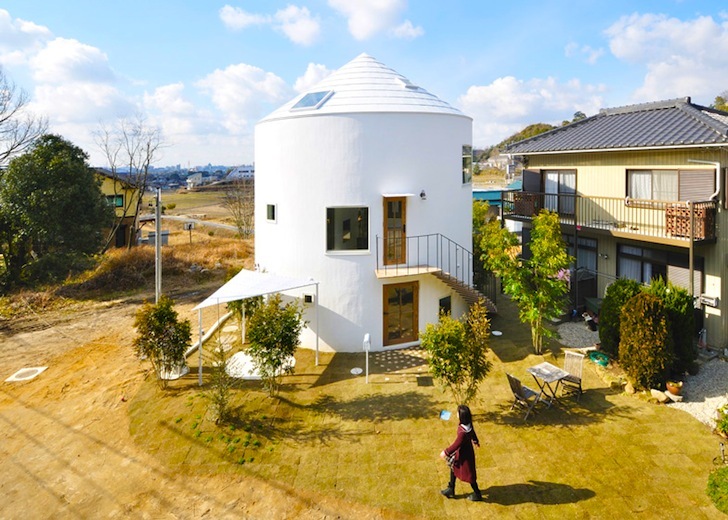 Studio Velocity recently completed the House in Chiharada, a playful, deceptively simple white cylindrical tower built in the garden of another residence. The tiny 110 square-meter house features five different staircases connecting its two floors and a diversity of spaces that challenge traditional views of residential design. Since the House in Chiharada was built very close to an existing residence, the designers chose a pure white cylindrical shape to contrast with the existing building’s traditional rectilinear form. The towers’ doors and windows were also sized at different heights and widths, adding yet another interesting quirk to the architecture. The circular ground floor is divided into four living quadrants: one master bedroom, two rooms for children, and a washroom. The ground floor was built with low ceilings in order to double the ceiling height of the second floor, which is flooded with natural light from skylights. Each room on the ground floor also has an enclosed staircase that doubles as a point of access to the upper-level and columns of light that help channel sunlight from the second floor into each of the rooms below. The last of the five staircases wraps around the outside perimeter of the house to create outdoor access to the second floor. 110 meters. The new "tiny". Since the House in Chiharada was built very close to an existing residence, the designers chose a pure white cylindrical shape to contrast with the existing building's traditional rectilinear form. The circular ground floor is divided into four living quadrants: one master bedroom, two rooms for children, and a washroom. 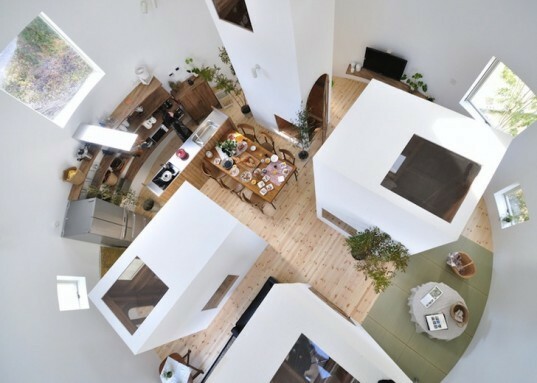 The architects explored different levels and spaces of varying sizes to create a playful atmosphere inside the house. An enclosed staircase connects light from the outside down to the ground floor while simultaneously creating a point of access between the two floors. The second floor features the kitchen and dining area. Each room on the ground floor also has an enclosed staircase that doubles as a point of access to the upper-level and as columns of light that help bring in light from the second floor into each of the rooms below. The ground floor was built with low ceilings in order to double the second floor's ceiling height. A cross section of the House in Chiharada shows the different levels and heights within the house as well as the various points of access.